Diana Kauffman Designs exhibits at trade shows throughout the Unites States to allow retailers an opportunity to try our product and to meet Diana. These shows are listed below. Additionally, Diana Kauffman Designs participates in local artist shows in Pittsburgh that are open to the public throughout the year. These events focus on artisan-made items and benefit our local community. We hope to see you at one of these events! NY NOW (Retailers Only with Valid Business ID) - Javits Center, NY, NY. 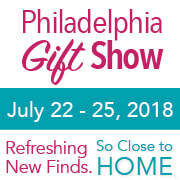 Philadelphia Gift Show (Retailers Only with Valid Business ID) - Greater Philadelphia Expo Center - Oaks, PA. Booth# 506. Click on the image to the right to register for free! This community event brings together Pittsburgh food trucks, artisan vendors and features Sewickley's boutiques and eateries along with live music on Beaver St. In addition to our studio being open to the public this night, we will be set up on Beaver St. with a selection of our handcrafted jewelry.